NTU Visual Arts Society News Blog: Animation Revelation -Nanoha the Movie and the Disappearance of Suzumiya Haruhi! 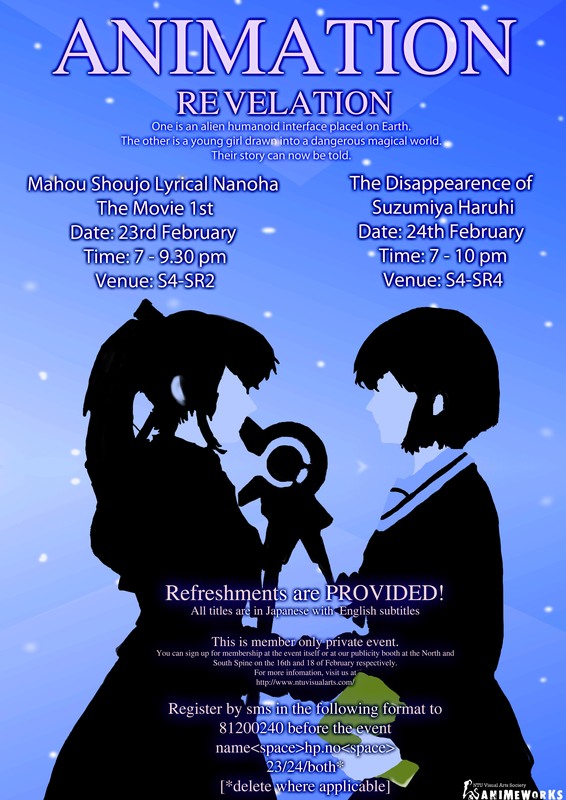 For this semester's Animation Revelation, we are proud to bring you two of the most highly anticipated animated movies of the decade - Mahou Shoujo Lyrical Nanoha the Movie 1st and The Disappearance of Suzumiya Haruhi! The screening is free for all members of the Visual Arts Society. If you want to catch the movies and are not a member - don't worry! Membership can be applied at our publicity booths and during the event itself. REFRESHMENTS ARE PROVIDED! To register, just sms your name, matric number, and movie you are interested in to 81200240, or email the same details to animeworks@ntuvisualarts.com. Alternatively, you can fill up this simple form here. The Disappearance of Suzumiya Haruhi picks up where the series end off. With Christmas just around the corner, Kyon looks forward, as much as he does, to the Christmas party Haruhi has planned for the SOS-Dan. But his reality was turned upside down when he awakens to a world where Suzumiya Haruhi did not exist. What would Kyon do when all he knows has changed? So what are you waiting for? Sign up for Animation Revelation now! I will fill out the form to see the movie, thank you.